Suunto Kailash uses your home location for 7R statistics as well as for keeping your home time up to date. 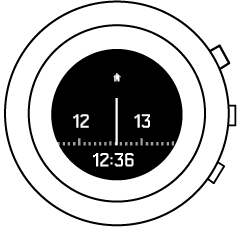 We recommend setting your home location as soon as you start using your watch. If you do not set your home location, you do not get a complete set of statistics in your 7R logbook (see Adjust settings). Press the lower button to scroll to LOCATION and select with the middle button. Press lower button to scroll to Set home location and select with the middle button.